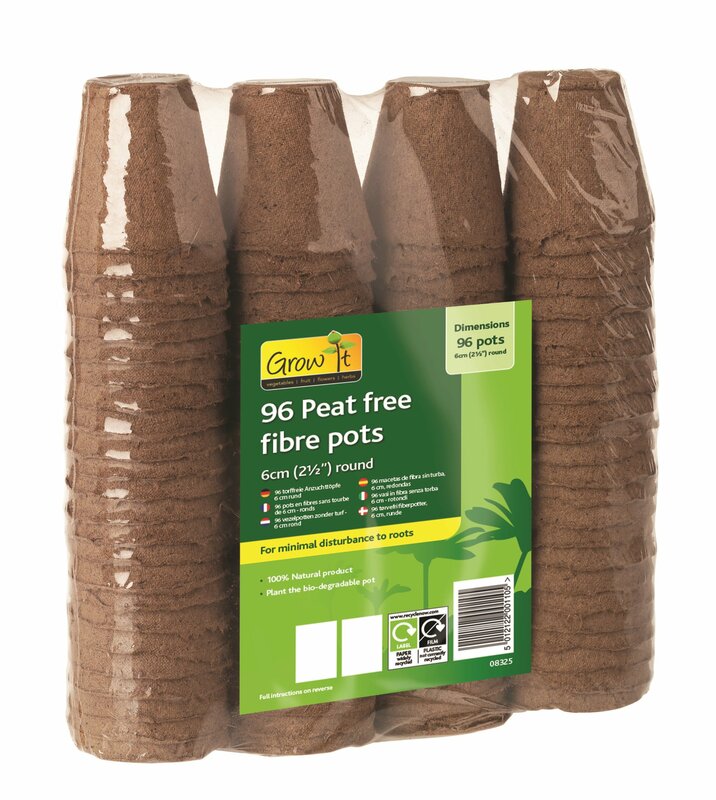 Note: There are two types of “peat pots” – the small fibre containers that you add your own mix too and the Jiffy product that contains a peat-based mix surrounded by mesh. This post is about the former (the ones in the picture above). Open up any vegetable gardening magazine, especially early in the year, and you’ll find dozens of pages littered with pictures of peat pots – usually with a seedling or two peering out of the top. They look good (almost as good as the vintage stuff). They’re much more natural than plastic module trays or repurposed toilet roll tubes…though don’t get me wrong, I’m not averse to toilet rolls at all!. If you’re thinking about transitioning to peat pots in favour of plastic ones for starting your seeds, especially if you do most of your growing in containers (where you can pop the peat pots directly into the potting mix in the bigger pots when it’s warm enough), then this post is for you. I’ve taken a balanced look at the pros and cons of using them and explored how different situations might have different demands. My final conclusion is that there isn’t really a black-and-white answer: sometimes peat pots are called for, sometimes they’re surplus to cost and requirement. I’ve also examined some of the most common problems that people experience when using them and talked about ways you can overcome them. Finally, I’ve recommended some inexpensive, high-quality options at the end. How are Peat Pots Made? Most pots are made of (non-peat) biodegradable materials. 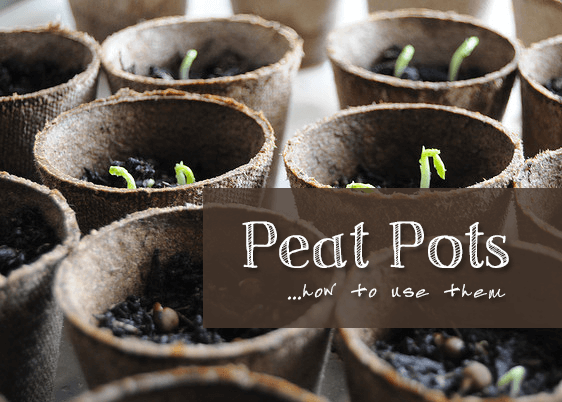 It’s worth distinguishing between peat and biodegradable pots. Whilst all peat pots are biodegradable, not all biodegradable pots are made from peat (I’m sure you can spot the philosophy degree there). The former are made from compressed peat (usually with additional materials) whereas the others are made from a similarly compressed organic material – wood or coir fibre, for instance. Sometimes you also get paper-mache type products too, which serve largely the same function. For our purposes, there’s no major difference between them. They all do essentially the same thing and I’ll use the term “peat pot” as a catch-all for the different types. Most are made of coir or wood fibre nowadays, so peat isn’t usually a viable buying option anyway. Jiffy pots are in the middle-right. 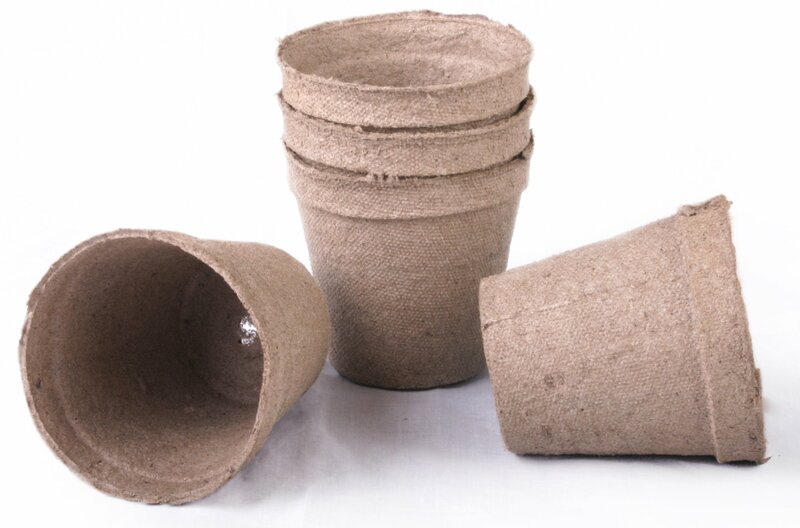 You may also have come across “Jiffy Peat Pots.” These are a slightly different product, also used for seed starting, made up of a small amount of peat-based potting mix contained within a thin mesh. Watering causes them to expand and you just pop your seeds into the top. The idea, much like normal peat pots, is that you can plant straight into the soil and that root growth isn’t inhibited by plastic walls. I’m not going to cover these. There are two options that you’ve got when buying – strips or pots. Strips resemble modules and are much better suited for those veggie seedlings that you aren’t intending to keep indoors for long periods of time. They’re also cheaper. Some plants hate being transplanted. The bigger pots are better for when you want to transplant a more mature seedling. If, for instance, you’re starting plants early indoors, when the outside temperature is too low, you can get some decent growth before taking them outside. The same applies for tomatoes and chillies started early in the year. They can be planted directly into soil. This is particularly useful for veggies that don’t like being transplanted. Parsnips, carrots and corn for instance, are best started in these types of pots. Root growth isn’t (as) inhibited. By the time the plant’s root system has grown large enough to fill the pot the absence of a physical barrier will mean that the roots won’t start to twist along the sides of the wall. What tends to happen is that the roots stop growing and instead branch off. This can mean more robust growth (also called air pruning). They’re comparatively expensive, especially if you usually use plug trays. Keepin the mix moist can sometimes be a hassle as the pot walls tend to be very absorptive. Mould and fungus seems to like the damp compressed fibre. Take a selective approach to using them. The plants that hate being transplanted will benefit from them. These include carrots, parsnips, squashes, cucumbers, radishes, beets and peas. If growing in larger pots, consider submerging them in sand to prevent the growth of fungus. Doing so will also allow further root growth. When the time comes for moving the plant you can lift it out of the sand which will fall away, leaving the roots undamaged. The peat/fibre is usually very absorptive so regular watering is a must. Make sure your potting mix is well-moistened before you fill them. Buy in bulk! A lot of people bemoan the price of these, year after year, when other options (like plastic module trays) are much cheaper. You can solve this problem by buying in bulk. 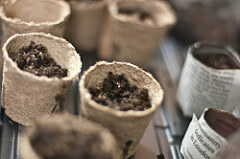 Where to Buy Peat or Biodegradable Pots? These are great for two reasons: they’re inexpensive and they’re completely environmentally friendly. The wood pulp from which they’re made also isn’t too thirsty, so won’t wick huge quantities of moisture from the soil. They’re the ones I use and I’m perfectly happy with them. These are “Jiffy” pots, but not the peat-filled expandable ones. Again, the balance here is between quality and value. These are very well-priced for what you’re getting (there’s 100 of them) and equally well made. I’d love to hear what your own experiences with peat/biodegradable pots are. I know it’s a rather contentious issue and I’m always up for a good debate! Being a new “urban” gardener this season, attempting to grow veggies in containers on my balcony, I was delighted to come across your website. I’ve just finished reading your advice on peat/fibre pots and the information was really useful; I made the mistake in February of planting seeds in the small strips and now know why they didn’t do well. I shall stick to the pots in future. How does one water these pots? I found that they seemed to collapse in on themselves when I watered the soil. Perhaps I overwatered? Anyway, thank you sooo much for your site, it’s going to be great learning all about container growing this summer. Hey Carol thanks so much for the kind words and apologies for my late reply! I’ve been inundated with work (and spending far too little time growing!). I’ve never actually had a problem with the pots falling in on themselves. How big are the plants by the time this happens? These peat pots aren’t meant to hold a plant for the entire season, through maturity, but are meant for starting the seeds in before it is warm enough to put them outside. As you are growing them on your balcony in containers and not directly in the ground, they wouldn’t be suited to your purpose as they are meant to fall apart and decompose in the ground. Hey Diane, thanks for the comment! I wasn’t aiming at container growers exclusively. In terms of container growing, what I was suggesting is to use them to start seedlings inside when it’s too cold then put them into potting mix in bigger pots outside, where they’ll rot away. Hi Diane, sorry for the late reply I’m just now getting round to my comments. 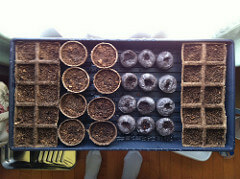 Ideally, you would have started the seedlings in peat pots. If you’re growing your beans in tiny plug trays then the peat pots could provide some extra space and you would only need to pop them in the ground then. Hi, I planted a load of tiny lavender plugs in fibre pots last spring; they’ve done well in terms of size (on a sunless sheltered patio), but since the onset of autumn have started to look dull and brown around the edges. Maybe that’s just what lavender always does this time of year. Any way, I’ve now moved them into the greenhouse, but am wondering whether I should transfer to larger pots since the roots are coming through. I think they’re still too small to plant out so intend to nurture them until next spring. TLDR: should I pot plants on once the roots are exposed, or is this not an issue with fibre pots? I use fibre pots for starting off lots of things, both veg and flowers, that don’t like root disturbance (carrots, fennel, lupins, poppies) I even sow nigella and cornflower in fibre pots in the autumn so I can plant out in spring because I have had little success with direct sowing. The problem I sometimes experience is that the pots can disintegrate before they are ready to go out. Any tips on preventing this? Hi Dave. Have you considered sowing in a seed tray and pricking out before transferring to peat pots? The root disturbance shouldn’t be significant enough at this early seedling stage and it’ll mean that you limit the time in peat pots. The other alternative is to tie some string around the peat pot, which will hold the soil together. You can then cut this away when it comes time to plant. Finally, two peat pots? One in the other? Thanks for the reply. I have found some success with putting the peat pot inside a small plastic pot. That way, I can tip the peat pot out if the plastic pot and plant it into the soil. I hadn’t considered using string around the peat pot. Will give it a try when I start sowing hardy annuals in the autumn. Excellent article. I was googling for an alternative to plastic cups for seedlings and found this, which really comprehensively answered my vexed questions! Glad you found it useful Ian! Hi John, peat pots aren’t really ideal for hydroponics. 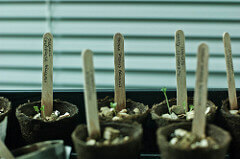 Their best use is for starting seeds before transferring into soil or a bigger pot so they can rot away. You’re far better off with plastic.